Arsenal continued their excellent start to life under Unai Emery with a 5-1 victory over Fulham at Craven Cottage on Sunday afternoon in a fixture which saw the Gunners carve open their opponents apart at will. Historically the Gunners are a side who pride themselves on free-flowing attacking football and Emery seems to be doing a fine job of continuing tradition so far. That Arsenal have scored at least 2 goals in 7 consecutive Premier League fixtures tells you all you need to know about their potency in-front of goal under the Spaniard. With the likes of Alexandre Lacazette, Pierre-Emerick Aubameyang and Mesut Ozil working in tandem, the post-Wenger era is shaping up to be a successful one, but it’s not all plain sailing for Emery. Aaron Ramsey has been an instrumental figure at Arsenal in the past half-decade, but a report from the BBC last month has all but confirmed he will leave on a free transfer when his contract expires next summer. His departure has provoked plenty of discussion in the British media in a year when Arsenal were forced to sell Alexis Sanchez to bitter rivals Manchester United to avoid losing him for nothing just 6 months later. 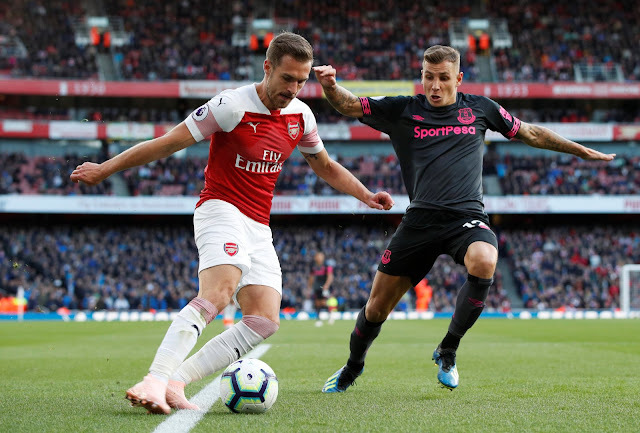 Whether a similar deal beckons for Ramsey in January remains to be seen, but one thing is for certain: Sky Sports pundit Paul Merson is absolutely bewildered by Arsenal’s failure to tie him down to a new deal. Speaking on The Debate, Merson asked questions of the Arsenal’s board and suggested that they have made another huge mistake which could play into the hands of one of their rivals. “Arsenal have got to ask themselves some serious questions. “It’s a great club, but whoever is letting people’s contracts run down is an absolute joke. Merson is well within his rights to question Arsenal’s board but it must be considered that Ramsey will have spent more than eight years with the club by the time his contract expires, so it’s more than likely that he has taken the decision to embark on a new challenge. Naturally, the Arsenal supporters will be disappointed by Ramsey’s decision, but he is by no means indispensable and they have the necessary resources to acquire a worthy replacement. Ramsey’s departure will undoubtedly represent Emery’s first major setback in the transfer market and he will need work in collaboration with Sven Mislintant to ensure they secure a worthy replacement. Arsenal fans – thoughts? Let us know below! We learnt that Arsenal withdrew the new contract at the last minute because of the huge size of the wage bill. But the question is why should Ozil still be in that club collecting £250,000 a week when he's practically lost everything that made him the Mezut Ozil we used to know. Ozil should be sold so the money should be spent wisely. Ramsey is more important to the club than Ozil. We learnt that Arsenal withdrew the new contract at the last minute because of the huge size of the wage bill. But the question is why should Ozil still be in that club collecting £250,000 a week when he's practically lost everything that made him the Mezut Ozil we used to know. Ozil should be sold so the money can be spent wisely. Ramsey is more important to the club than Ozil.